Get the Full StoryWhen it comes to engagement rings, maybe you prefer small, big, or unique. 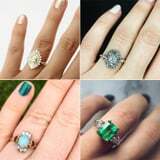 No matter the cut you adore, though, it's easy to see why many women go for vintage-inspired jewels to embellish their left hands - they're simply breathtaking! Ahead are incredible engagement rings that will fuel your love of antiques.